When it came to climbing and social issues, Junko Tabei was not afraid to lead into uncharted territory. 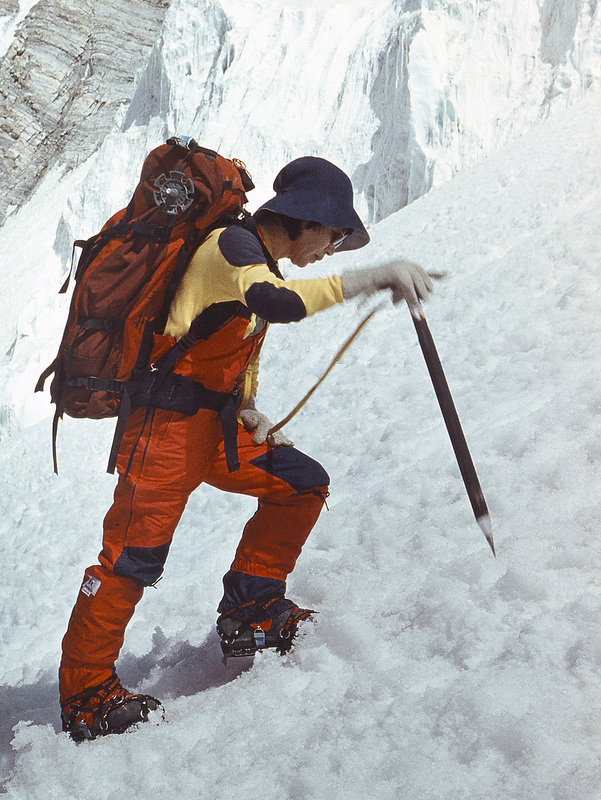 She made the first female, the first Japanese, and the second overall ascent of Annapurna III (7555m) by a new route in 1970, and in 1975 she became the first woman to summit Mt. Everest (8848m). She went on to become the first woman to climb the Seven Summits (the highest peak of each continent) in 1992, and by 2005 she had participated in forty-four all-female expeditions to big mountains around the globe. She was 77 years old when she died of cancer October 20. During her four-year struggle with illness, she had continued to climb and only slowed down near the end. She is survived by her husband, Masanobu Tabei, and a daughter and son, Noriko and Shinya. Born September 22, 1939, she grew up in Fukushima Prefecture, Japan, in relative poverty and was considered a "weak child," according to her website. Her profile states that she was introduced to climbing in fourth grade when her teacher led her to summits in the Nasu Mountains. She graduated from Showa Women's University in 1962 with a degree in English and American Literature. At that point, she was becoming more involved in climbing clubs, and she established the "Ladies Climbing Club: Japan" in 1969. The group's slogan was, "Let's go on an overseas expedition by ourselves." "Back in 1970s Japan, it was still widely considered that men were the ones to work outside and women would stay at home," Tabei told the The Japan Times in 2012. "Even women who had jobs—they were asked just to serve tea. So it was unthinkable for them to be promoted in their workplaces." "At the beginning, she climbed with male partners," said Tsunemichi Ikeda, the former associate editor of Japan's Iwa-to-Yuki (Rock and Snow) Magazine, who first interviewed Tabei after her 1975 Everest ascent. "At the time, female climbers were only followers on the wall, but that wasn't the case with Junko. She thought to climb with her own speed and techniques, and roped up with women. Rumie Saso became her best partner but she died in the mountains." Tabei went on to climb many of the highest peaks around the world in pursuit of her goal to climb the tallest mountain in each country; she managed to stand atop fifty-six of them (approximately a third of the total number) between 1970 and 2008. "I've never felt like stopping climbing—and I never will—even when I myself have seen people killed in accidents in the mountains," she told The Japan Times. She shared her love of the outdoors with her family. Her son, Shinya, continues to climb. He now owns a climbing gym in Tokyo. Her daughter, Noriko, was three years old when her mother climbed Everest at age 35 as the deputy leader of a 15-member all-female expedition. In their book Fallen Giants, Maurice Isserman and Stewart Weaver wrote that Tabei "was almost certainly the only Everest summiteer to raise the money for her share of expedition costs giving piano lessons." An article by Amanda Padoan reports that Tabei's "pants were cut from old curtains. She padded her own sleeping bag and fashioned waterproof gloves from the cover of her car." On Everest, an avalanche struck Camp II during the night, affecting thirteen people. Tabei was partially buried in her tent along with one of the expedition guides. She was seriously injured and soon immobilized, but she was able to remove a pocketknife and pass it to her companion before she blacked out. The knife aided in their rescue as the guide used it to cut their way out of the tent. Twelve days later, she was en route to the summit when she was surprised by the exposed knife-edge traverse. She had to straddle the ridge, stepping carefully to make her way across in high winds and soft, unstable snow. "I had no idea I would have to face that, even though I'd read all the accounts of previous expeditions," she told The Japan Times. A 1996 Sports Illustrated story reported that she had been so battered and bruised from the avalanche that it had taken her two days to walk again: When she finally summited, along with the expedition sirdar Ang Tshering Sherpa, "she felt no elation. The pain robbed her of that. 'All I felt was relief,' she [said]." Eleven days after Tabei's summit, Phantog, of Tibet, became the second woman to climb the mountain, and the first woman to climb the North Face. She only used supplemental oxygen during her rest breaks and ended up losing three toes to frostbite. Tabei's 1975 expedition had included a television crew, three journalists, four cameramen, twenty-three support climbers and about 500 porters as well as six Sherpa guides. As the years passed and the commercial guiding and popularity of Everest took off, however, she became an advocate for addressing human impacts in the area. In 2010 she completed a masters course in comparative social culture at Japan's Kyushu University with the study theme, "Garbage problem in the Himalayas." The 2012 article in The Japan Times reports: "... Tabei has campaigned for sustainable mountaineering, and researched the garbage problem on Everest in graduate studies.... Her research included quantifying the amount of rubbish and refuse that has accumulated up there since the first expedition in [the early 1920s]. Tabei arrived at the conclusion, through questionnaires to mountaineering societies around the world and by poring over expedition records, that just at Base Camp ... some 1.03 million liters of urine had been released by climbers and others as of 2000. 'That is enough to fill 3,300 bathtubs," [she said]. 'And there are villagers (at the foot of Everest) who are dependent on meltwater from there for their living.'" In her 2012 interview with The Japan Times, Tabei bemoaned the increasing popularity of Everest after permit restrictions were lifted in the '90s. "Climbing Everest has become a status symbol, and even a big entertainment," she [said]. "People have started competing over the speed in which they've made the ascent, whether they climbed the peak by themselves, and how old they were when they made it to the top. They have boasted how long they could stay on the summit, how long they were free of oxygen tanks, or how they managed to be naked on the peak. There's been this thinking that you have to do something to get attention." In addition to her prolific mountaineering, Tabei became the author of seven books published between 1996 and 2008. Nonetheless, she was famously modest, referring to herself as "just the thirty-sixth person" to summit Everest. "She [seemed] very careful talking about her ascent," Ikeda said recently. "She...emphasized that the success was not her own achievement but all the team members'. I thought that she [was] eager to avoid friction among teammates." In 2011 the Great East Japan Earthquake caused devastation in Tabei's home city of Fukushima when a tsunami wave disrupted a nuclear power plant. A year later, Tabei organized a group to guide affected school children from the area up Mt. Fuji (3776m) each year. "This project was very important [to] her, since she was born and raised in Fukushima," Shinya said. "We...plan to continue it each year for the next ten years." The last climbing Tabei did was on the annual trip up Mt. Fuji with the students, three months before she passed away. Shinya said his mother was already dying of cancer in the hospital at that point, but she got special permission from the doctor to make the trip. She was able to reach an elevation of 3100 meters on the mountain before her ailing health forced her to turn around. 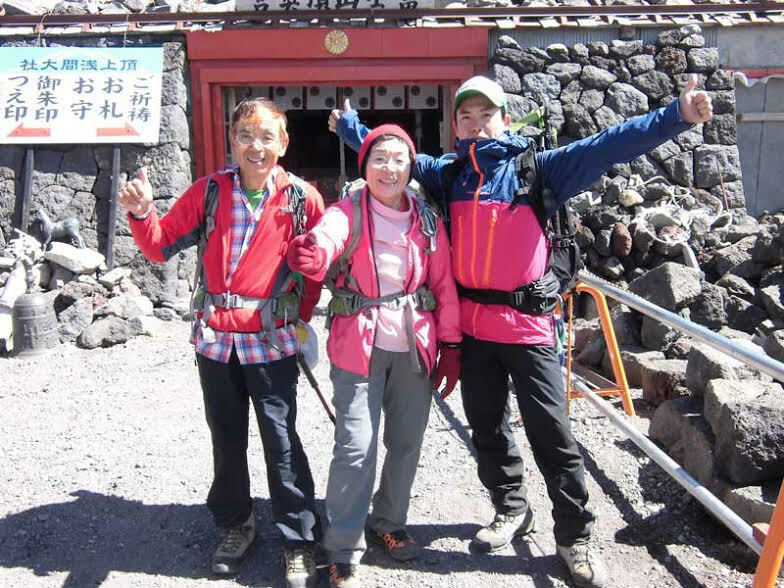 "She simply loved climbing mountains around the world," Shinya said. Kashiwa Sumiko is a Japanese journalist who climbed with Tabei and visited her shortly before she died. "I have interviewed [her] many times since I became a freelance journalist twenty years ago," Sumiko said. "She and I established [a] mountaineering club for twenty- to forty-year-old women, and I climbed and hiked mountains in Japan, Nepal, Hong Kong and Korea with the club.... I met with her on her 77th birthday on September 15, and I met with her husband in her hospital room at the end of September. I understood that it was the last time to see her. But she always said, 'Always smile and don't be upset.... I knew it was the last time [I would see her], but I was smiling and said, 'I'll see you!' when I left her room." "The one thing she used to tell me [as a child] is to be nice to people around me," Shinya said. "No matter how badly we [fought] in our family, we [were told] to say, 'I'll see you later' or 'Good luck' when we saw each other the next morning, [because] if anything happened during that day, those words [could] be the last conversation for us."